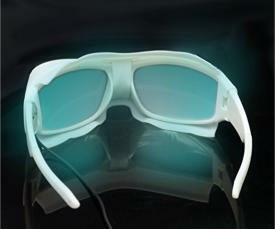 Expand your Kasina experience - and your mind - with the new DeepVision eyes-open (Ganzfeld) glasses. "I've been using them for a couple of days now, and even within the first thirty seconds of trying them, I knew these were something special. The manufacturers of light and sound machines have tried for years to introduce a full spectrum of colours into their products, but for me, the result had always been a bit underwhelming, because you had to use the glasses through closed eyes. This meant that everything had a muted, reddish hue. With these glasses, full colour has finally arrived! Seriously, it's like gazing into a luminous, endlessly shifting kaleidoscopic rainbow, with pinks, purples, blazing red, deep blues, and also bright white. It's utterly immersive, mesmerising and hypnotic. The glasses themselves are relatively light, perfectly comfortable, and they block out just about everything in your peripheral vision." When you use the new Deep Vision GanzFrames with your Kasina, your entire field of view is filled with pure, jewel-like colors and dancing patterns. As well as using them with your eyes closed, the light produced by the Deep Vision GanzFrames is so diffuse that you can comfortably use them with your eyes open. The Deep Vision GanzFrames are wrapped in an attractive lightweight shell with soft, hypoallergenic silicone, with lips at the top and bottom to help block out ambient light, for a more immersive experience.